"What day is it?" 11 tweets that nail the time between Christmas and NYE. 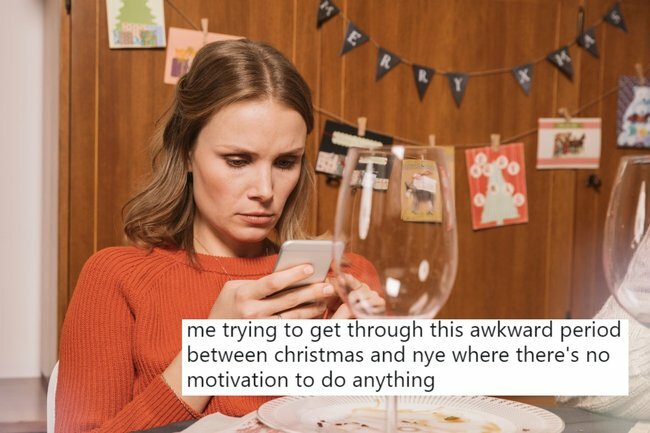 11 tweets that nail that awkward period between Christmas and New Year's Eve. It’s Thursday December 27 and to most of us, that’s really not vital information – because in this hazy time between Christmas Day and New Year’s Eve who even cares what day it is? These 11 tweets some up perfectly what it is to exist in the time after the Christmas presents have been opened, but before we break out the sparklers, poppers and party dresses. We’re now in those hazy days between Christmas and New Year’s … is it Thursday? Saturday? Have I eaten today? Should I set an alarm or sleep all day? Do I care if I wear the same thing again? WTF do you mean what’s for dinner? It’s leftovers. Leftovers are for dinner and I suggest you eat sparingly cause that’s it until New Year’s dinner….. It is the period between Christmas and New year. No one knows what day it is. Time doesn’t really exist. Can we start drinking at 10am? Why not. Existence is a confusion. This time between Christmas Day and New Years, it’s the longest Sunday. Its now that awkward time period where its after boxing day and not quite the new year where im not sure at what point im meant to stop eating leftovers. Or stop drinking? Had wine for breakfast, brandy for lunch, amaretto in the afternoon and then remembered that coffee exists, so had a cup for dinner. That awkward period between Xmas and New Years where you wonder if you should take a break or just stay drunk ???????????? now that we’ve reached that awkward period between christmas and new years, i would like to propose a new holiday: sleep. in which you take a four day nap. We hope knowing that you are not alone makes getting through this period just a little easier.